NPE occurs when add calendar resource from "Other Resource"
There has a new defect when we include LPS-67557 and LPS-67894. 1) Base on a clean database. 2) Enable local live in Liferay (Select Calendar) and create a new user who belongs to Liferay Site and have Site Administrator role. 3) Login with that user. 4) Added a page and calendar portlet into it. 5) Added 2 resources Industry and Training. 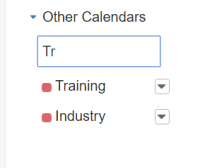 6) Added these two resources as Calendar in Calendar Portlet (Other Calendars section). 7) Refresh UI, repeat step 6.